In the fifties when I started with radio, they were all equipped with radio tubes. My first receiver was a big American radio which had a couple off very good shortwave bands. I listened on that receiver to Scheveningen radio (Dutch coast guard radio) and that was also the first time I heard Radio amateurs on the 80-meter band. 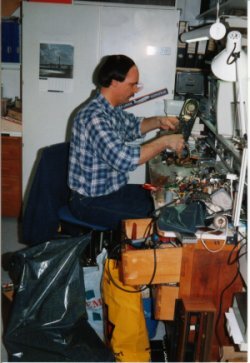 At the end of the sixties I started with building my own HF receiver which was a combination of the, at that time popular Philips 2010 and the G2DAF receiver. I shared both designs and built a receiver for the 80-10 meter bands (of course with tubes). 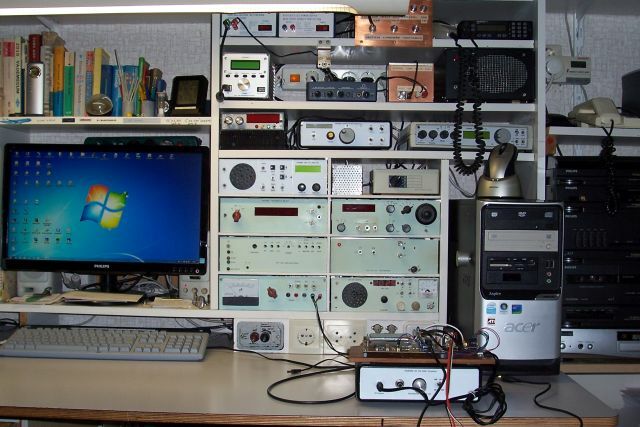 Left on the photograph of my first shack, you see the HF receiver (at that moment under construction). On the right, you see the scope which in former days did service to watch the Dutch TV. Above the HF receiver you see an old S&H Morse telegraph which writes Morse code on a paper tape. With this device a cw station could be made visible with the help of a telex converter. Yes, in those days I used that telex converter also for controlling a Teletype TT15 telex machine. That apparatus stood stamping regularly to print all kinds of bulletins of several press stations (Reuter, Tass, AP). From my first salary I bought a 19-set for fl. 30, – (€ 14,-) at Radio Lensen (a famous army dump store in Amsterdam). On this receiver I listened on the short – and medium wave (Radio Veronica!). At a certain time, the higher frequencies got my interest. That was because of the rise of the fm-band. I have got an FM-unit (with EF80 tubes) with LF output and I was experimenting trying to increase (avionic band) or decrease (police band) the receiving frequency. Due to an article in Electron I became interested in the 2-meter band. I built for that band a converter with 6J6 and EC900 (on the photograph on the right site of the HF-Rx). I started with a 5 element beam which was mounted just near the window of my room and could be rotate by hand through the open window (which was very cold in winter..). Later I built a 10 element beam for 2-meter and 70-cm. 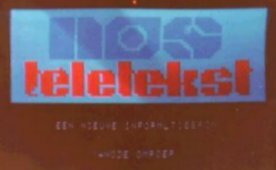 In 1965 the second Dutch TV channel was introduced. 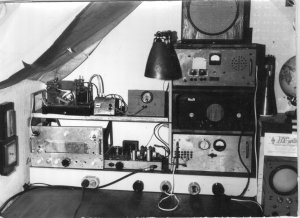 With a ‘ 2e-net converter ‘ described in Electron and a home made beam under the roof of our house, the first transmissions were received on the UHF (channel 27). By my interest in the space travel (the seventies) I went busy with the reception of weather satellites and built a receiver for the frequencies on which they transmit (137 MHz). In the middle of the photograph below you can see the receiver, just above the BC348 receiver. On that photograph you can see further right of the 137 MHz receiver the device that made the weather satellite pictures visible on an old b/w television. See also my project page ‘Weather Satellites‘. Right of the BC348, you see a 200-400 MHz army receiver. On the workbench the 2 meters transceiver under construction. ATV in the 70’s was usual on the 70 cm band. I modified the tuner of a portable TV so that it I could reach channel 17, that was the channel where I could receive a lot of ATV stations from Amsterdam and surroundings. However, it was necessary to put a preamplifier between antenna and the tuner. In that time I made much duplex QSO’s with ATV stations. See also my ATV page. 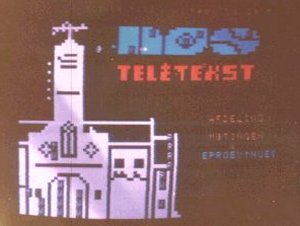 In the eighties the Dutch television started with test transmissions of Teletekst (videotext). In the United Kingdom it was already operational (BBC-CEEFAX). In a magazine of the RSGB I found a description of how a Teletekst converter could be build with a lot of IC’s (approx. 90!). I constructed it on 4 home made printed circuit boards and did most of the connections between the IC’s with povin wire. I got it working (not entirely 100%..) but the adjustments of the analog part were very critical. I received the test pages of studio Irene (on the right) and the start page on the left. 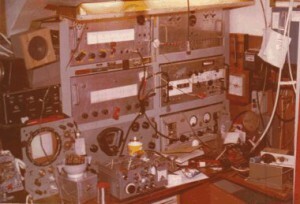 When I moved from Amstelveen to Alphen a/d Rijn in 1983, the radio hobby stood still for a wile. Much of my time was spent to get familiar with the Computer. Also the shack got a new look. I introduced a ‘ standard ‘ for the dimensions of my home made apparatus, clearly visible on the photograph below, which was made in 2014. – Just below the TL-tube, two 13.8V power supplies. On the right my Antenna patch panel and MC70 70cm TRx. – KTH-SDR, EMU0202 USB sound card, WX-sat SDR black box and power-supply with loudspeaker for the MC70. – The modified Teletron T813 2 meter transceiver, DC-HF transceiver and PIC controlled 0-54 MHz HF receiver. – And on the right, my desktop PC (AMD FX4300), no… only the enclosure is ACER…..
– 35 cm dish for reception of PI6ATV. – Magnetic loop antenna made of 15 mm copper tube with vacuum condenser . Since I am not such a ‘roof hare’ as I was when I was young (see photograph below), I have mounted the antenna mast (with X2000, mini whip and dish) in such a way that I can handle it out of the Velux roof window. 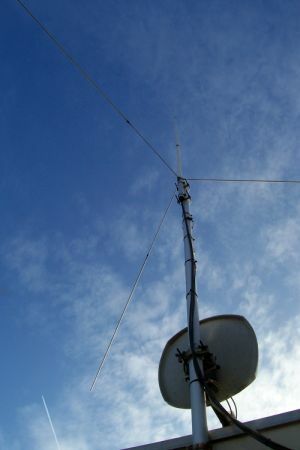 The dish antenna is at this moment mounted horizontal for receiving 3cm ATV. The X2000 is modified by adding longer radials for 50 MHz. 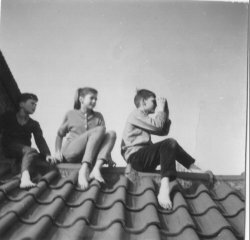 The photograph below was taken by my sister Rina when we climbed on the roof of my parental house in Amstelveen together with, on the left, our friends Frenk and Karin (1960?). Thank goodness that my parents did not known that……… I’m looking with a binoculars towards the ‘old ‘ Schiphol Amsterdam Airport near the ‘Amsterdamse Bos’. On the photograph below you see me disassembling old electronic apparatus, to collect useful parts to keep my stock sufficient for the next 100 years….. I also gather aluminum, copper and wire, and once a year I sell it to a second hand dealer to get some money to buy me new components, that is real recycling!